This is one of many examples where tube testing requires experience to properly evaluate any tube. In this situation, using a tube tester would yield a completely wrong answer. These tubes were factory marked as E283CC, but are actually 12AX7A tubes. Hence, if you tested them in your tube tester using E283CC settings, you would have concluded that the tubes were shorted and defective, and you would have discarded valuable NOS 12AX7A audio tubes. The fact that these were not E283CC was readily apparent to anyone with experience. 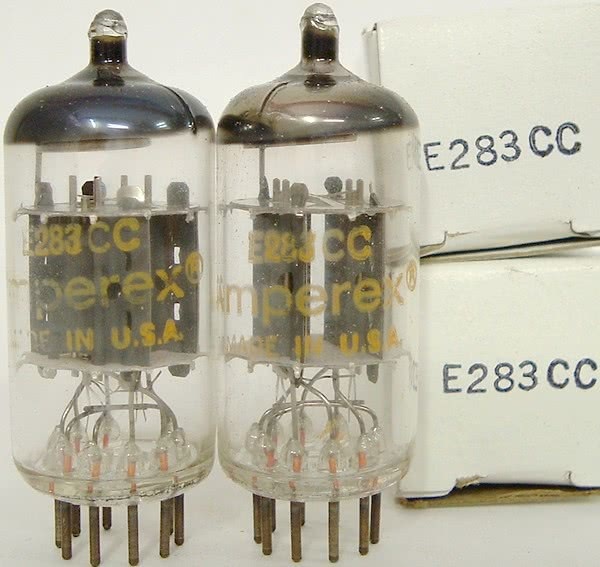 E283CC is a “special quality version 12AX7 for audiophile” with three distinguishing characteristics: (1) different pinout than 12AX7, (2) only a 6.3v heater, (3) a shield between triode sections that terminates at pin 7. A shield between triode sections would be easily visible, and these tubes do not have a shield. Hence, they are not E283CC. Since E283CC is a “special quality version of 12AX7”, that was a logical place to start. Experience shows that they look like Amperex 12AX7A tubes, and testing them as 12AX7A verified that premise. In fact, each tube is well balanced between its triode sections, and they are quality audiophile 12AX7A examples. (Tube #1: Triode #1 = 36, Triode #2 = 36. Tube #2: Triode #1 = 31, Triode #2 = 30. Test scores from my professionally calibrated B&K 707 mutual conductance tube tester, and also without shorts or leakage. For 12AX7, scores of 22+ good, with scores in 33 range considered typical new). Lessons: (1) experience matters, (2) tube tester results MUST be interpreted based upon experience, and not blindly accepted as gospel, (3) you should have the experience to recognize when a tube does not look correct as marked, because blindly inserting a wrong tube into your equipment may cause serious damage and/or fireworks. I am frequently asked to explain what all of the “letters and numbers” mean in a vacuum tube number. In the early days of radio, tube numbers were haphazardly assigned to new tube types. As more vacuum tube types were developed, it became more difficult for technicians to recognize any fundamental characteristics about a tube. To alleviate this confusion, the Radio Manufacturers Association (RMA) developed a tube numbering standard. The standard allows a technician to have at least a basic understanding of the construction and purpose of a tube. Notes: Early vacuum tubes with 2-digits (such as #50) and 3-digits (such as #485) predate the RMA standard. Similarly, 4-digit industrial/commercial numbers are not part of this standard. The standard consists of a first numeral(s), followed by a letter or two letters, a last numeral, and optionally letter suffix(es). Also, there are tube numbers that look like they were part of the numbering standard, but in fact they were not. An example is 2D21. by Bob Putnak, ©2010. All rights reserved. Last update: Jan 2014. Your tube tester is often the first test instrument that you reach for when diagnosing problems in tube gear. All tube testers are a compromise in functionality, compromise in accuracy, and none are perfect. No models test for all tube characteristics. Not even the tube manufacturers themselves had test equipment that could detect all bad tubes, or verify all good tubes, or test for all tube characteristics. A 100% accurate tube tester is not even possible because a tube can work excellent in one circuit and not work at all in another circuit. Tube testers were designed as a tool for repairmen to detect “bad” tubes… tubes that could be causing a problem in the item that the technician was repairing. Tube testers do a very good job in this role. However, many people do not use a tube tester properly, do not interpret the results correctly, or have unreasonable expectations of them. Other people have developed poor workflow habits that need to be improved. While each tube tester has different capabilities and therefore different operating instructions, here are my thoughts regarding tubes, testing, and all tube testers in general. I found an interesting article about the value of a tube tester to a service technician in the Feb-March 1957 issue of National Radio-TV News. I scanned the article, cleaned it up with photoshop, and make it available as a PDF [HERE]. In the article, the author Walter Swontek argues that a primary value in having a tube tester was as a tube-selling aid. It was hard to sell a tube to a cautious customer just based upon the word of the repairman, so the tube tester was “proof” that the tube was bad. Swontek also correctly observes that a tube tester should be looked upon as a fact-indicating device — not as a judge. The results must be interpreted and judged, no different than you would with a voltmeter or other test equipment. This isn’t what a novice wants to hear, but this is reality. Bulls-eye. Swontek could hardly have known how prescient his words would be. Everyday on chat forums, you find fanboys of this-or-that-model tube tester, discussing their tin god as the arbiter of tube testing excellence, but without themselves having any real expertise regarding the technicalities of its test circuit, the strengths or weaknesses of their model (and the weaknesses are many…), nor any real knowledge of how tubes work. It is rare indeed for one to say, simply and concisely, that their tester does a good job at FINDING BAD TUBES. Word up, folks — a tube tester is a diagnostic tool designed to FIND BAD TUBES — not “rate” good tubes. Finally, Swontek also agrees that the Shorts test is of far more value than the emission or transconductance test. Want another opinion about tube testing? Here is the article entitled “Fine Points on Tube Testing” from Test Equipment Annual 1958. A PDF of the article can be downloaded [ HERE ]. Use a calibrated or professionally serviced tube tester. Do not test tubes with dirty or rusty pins. Tubes with multiple sections, each section must be individually tested. Configure test settings before inserting the tube. Adjust “Line control” both before AND after inserting tube. Filament test is always the first test made. Shorts Test(s) will be the second test made and must always be performed before any Emission or Gm test. Leakage test will be the third test made (if Leakage test is separate from Shorts test in your tube tester). The Shorts and Leakage test(s) are the most important tests you will make. For any tube, there is no one “TEST SCORE” that is “right”. Some tube types do NOT even have a “test score”. No tube tester will tell you whether an oscillator tube will work properly in-circuit. Now that you have some understanding how LIMITED the usefulness of a “test score” is, you can proceed to make your Emission/Gm test. Do NOT perform the Emission or Gm test until the tube has had sufficient time to warm up. Do NOT perform the Emission or Gm test for ANY LONGER TIME than necessary to get a reading. Interpreting Good/Weak emission and Gm test results. I am frequently asked by B&K and Hickok owners to explain how to replace a #83 tube with a solid state version. This question is popular because #83 tubes are scare and expensive. Other benefits are increased reliability (no tube to wear down), less heat generated inside the tester case, and less load on the power transformer. So, if you want to Do-It-Yourself, I will explain how these replacements are made. Personally, I always use a solid-state replacement for B&K testers. For most Hickok, I prefer to use a real #83 tube only because circuit modifications are sometimes necessary, which makes going back to a real #83 difficult for the tube tester owner or future buyer. This problem is particularly true for the “red-case” Hickok’s. That said, I have no disapproval with using a solid-state #83 in a Hickok model that lends itself to working well, and have found that any tube “test score” differences are trivial. In my opinion, the people who argue about small test score variations are really over-thinking the purpose of testing a tube — the end-result is NOT a test score, but to ascertain whether the tube will work satisfactory in your circuit. Common sense and practicality are important. brown-black getter flashing does not mean ‘Used’! Discolored getter flashing (brown or black marks) does not mean that a tube was used. This fiction is believed by both uninformed buyers and seasoned tube jockeys. This myth seems credible because some new tubes have perfect shiny mirror getter flashing; therefore the assumption is that brown or black stains in the getter flashing must indicate a used tube. The myth says that the more brown/black discoloration, the “more used” the tube is. Wrong.